I was joking when I said that 30 was old. Over the last 5 months I’ve been making all sorts of financial rules for myself that I, more or less, have been sticking to. Planned spending is something that I learned about when I started reading the wonderful personal finance blog Blonde on a Budget. It is the notion that when you know you will be needing/wanting to spend money on a trip/wedding/shopping spree/furniture/moving/whatever, you financially plan for it. Let me tell you, I had a lot of extras this summer and if I hadn’t been planning for them since the Spring I may have died from stress. This is seriously the best financial tip I’ve ever received and if you are human who has both logic and foresight, I suggest you try it. Unless you have more money than you know what to do with, then whatever. Despite sticking to all these personal finance rules and reading this one personal finance blog, I am really great at coming up with reasons why now is not the right time to started writing out a monthly budget. My best excuse to date is: This month (whatever month I’m coming up to) has so many extras, it would make sense to start a budget on a more “normal” month. But enough with excuses…here we go! September is a far from normal month, with a wedding in Prince George where I’m the Maid of Honour, Rifflandia, a belated 6 month anniversay dinner with my love and a weekend trip to Vancouver to see the National, it’s actually going to be a very expensive month. I’m happy to say it’s all paid for! It is time of year when office interns have to go back to school. Such is the case at my office; we said good bye to the super rad young lady we had the pleasure of working with all summer. To send her off properly we had, obviously, a pizza lunch! As the lone vegetarian (pescaratian) in the office, I was tasked with placing the order with Panago. Because I’m a nice person I went with 1 meat, 1 chicken, and 1 extra delicious Veggie Korma Pizza. So good. I had 5 pieces. I’ll assume you know what to do from here, it’s pizza remember. I’ll also note that I used jalapeños because I couldn’t find any banana peppers, which I think would also go really well and what Panago themselves chose to use. I will admit that I was sceptical at first, I was definitely doubting my idea. And then I realised that maybe making this for Megan was a mistake, as she is widely known for making the best home made pizzas of all time (she even makes the dough from scratch!!). At this point however, I was in too deep. I just went for it and I’m glad I did. These pizzas were amazing!!! Megs and I each had a pizza and a half, that is how good they were. Guys, if you like pizza and want to go with something a bit cheaper and healthier than ordering Panago…try this at home! Today is a big day for a lot of people in the Republic of the Congo. The NGO I work for runs the world’s largest hospital ship and provides medical attention to people who may not otherwise have the chance to see a doctor. Today is screening day and its outcomes will determine who will get care over the next 10 months. The last I heard there were over 7000 sick or suffering people waiting in line. Every year we treat thousands of patients, but sadly, we also have to turn thousands away. While today will be a joyous one for so many, it will also be a devastating one for those who we cannot help. I do not envy our incredible volunteers who have to turn people away. One of the most beautiful stories I have ever heard happened at a screening in Togo many years ago. Over 6000 people were crushed into a stadium, just waiting for their chance to see one of our volunteer doctors. 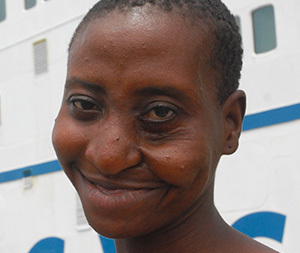 Among them was a 9-year-old girl named Edoh, with a facial tumour so large she struggled to breath. Her family had taken her to hospitals all over West Africa, but they were unable to find anyone who could help. Every single one of those 6000 people needed medical attention, but the large crowd collectively recognized that Edoh needed it more. She was picked up overhead and passed through the crowd (kicking and screaming) to the front of the line. She eventually had her surgery and it saved her life. The work that our volunteers do every year is finite. Because Edoh got her surgery, it may have meant that someone in the crowd that held her up did not get theirs. And those people knew the risk, but that did not stop anyone from helping. Stories like this one are why I love going to work every morning. For dinner on Thursday I had take out sushi. For lunch on Friday I had tapioca pudding. Same for early dinner (it’s a thing). For late dinner (also a thing) my boyfriend and I split Tibetan momos and prawn red curry from The Mint. On Saturday morning we split a breakfast strata from 2% Jazz (probably try it). For dinner on Saturday I ate oily pub stirfry. For Sunday breakfast I had super delicious latkes from The Village. On Sunday night Kurt and I split pad thai and vegetarian red curry from Little Thai Place. 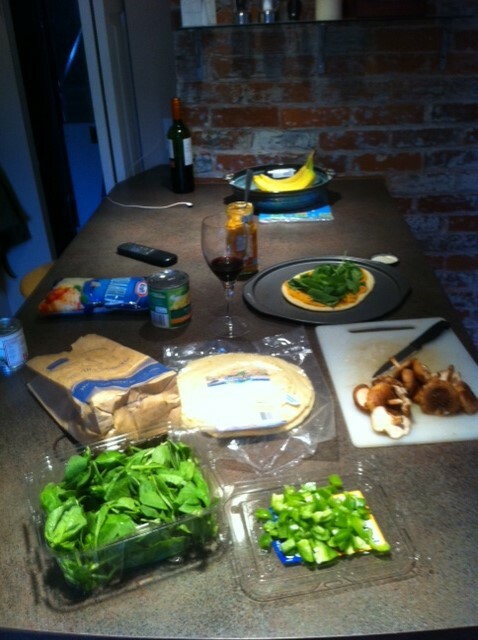 On Monday for dinner I pulled up my health socks and cooked for the first time in days. I chopped up a crown of broccoli, an orange pepper, a zucchini, and about 10 shitake mushrooms and steamed them for 10 minutes. I boiled some of those tofu noodles and mixed everything together in a pot. I added a couple tablespoons of peanut satay sauce and a couple teaspoons of soy sauce and done. So good and so healthy and ready in less than 15 minutes. I went to see this rad guy play on Friday night and wow. He was suggested to me by my friend Megan who has great taste. After a couple of youtube listens, Kurt, Megan and I decided to head out and make a night of it. Online, White Buffalo kind of sounds like a cool combination of Ronnie Hawkins and Eddie Vedder (my boyfriend’s words) but live….unreal. I honestly did not want to the show to end, I could have stayed there and listened all night. If you ever get the chance to see White Buffalo, you definitely should. On a hardly related note, the show was at a bar. In my head I’m totally the kind of girl who goes to bars all the time, but when I think about it, the last time I was in one was May (to be clear, I’m in pubs on the regular. It’s bars that have become foreign to me). When the doors opened at 8PM, most of the audience were normal looking people in their late 20’s and early 30’s. Lots of beards and plaid. By 9:30 the room was packed with kids who were very clearly out to pick up. I’m unclear if it was the venue or if White Buffalo’s music just attracts the young and eager. The scenes that played out in front of me were absolutely fascinating. I wish I had an invisibility cloak so I would have seemed less like a creepy starer. I didn’t have one though, obviously. Good fish tacos. Fun people watching patio, but you already knew that. Good fish tacos. Beautiful view (it’s at the breakwater, hence the name). While I was there the server mentioned it was their staff party the night before, but the service was still great, which says a lot about the quality of the staff. Oyster used to have Taco Tuesday and would have fish tacos for $2 each. Every time I went I couldn’t believe there wasn’t a line up out the door. They’ve changed it up now, they have one type of taco on feature for $3 and it’s usually chicken. There are still great fish tacos on the menu though, and for some reason they taste even better full price. By far the biggest portion in town (that I’ve tried), plus you get soup, salad or fries. Also, the service here is always above and beyond. Both the room and the patio here are unreal. And the fish tacos are really great. I love food trucks. And the tacos are cheap and the fish is deep fried, which puts them at the top of my list. This is my favourite reincarnation of this room, as it no longer feels like a wannabe Miami lounge. The beer list is awesome and the fish tacos are excellent (also deep fried). If you’re ever there, check them out. So good. They also have an awesome beer list featuring microbreweries from all over the Pacific Northwest. If a big man with a big beard named Pete serves you, tell him Katie, Megan and Colleen sent you. There is a 93% chance he won’t know what you’re talking about and a 7% he will laugh and buy you a beer. Worth a shot! How great is this song? Really great. I feel like I’ve been hearing it a lot lately…commercial? Or on the soundtrack to one of the Netflix shows I’ve been binging on? Who cares, great jam. It’s Saturday. I’m lazy. Here is a list.